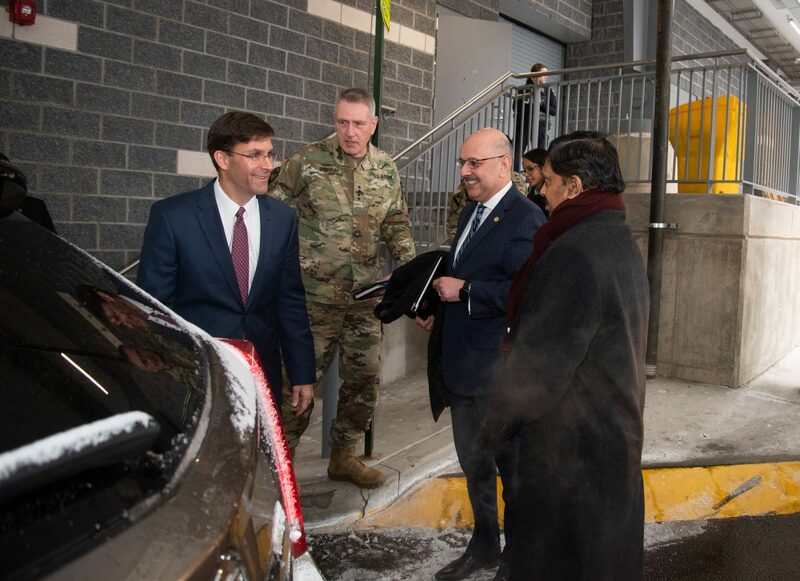 Carnegie Mellon University hosted the Secretary of the Army, Mark Esper and General Murray, Commanding General of the U.S. Army Futures Command and Brigadier General Matthew Easley, for the announcement that the United States Army is activating its Artificial Intelligence (AI) Task Force at CMU. The event was hosted at both the National Robotics Engineering Center (NREC) and main campus at CMU. Secretary Esper and CMU’s president, Farnam Jahanian, rode from CMU’s campus in Oakland to NREC in Lawrenceville in the University Transportation Center’s Autonomous Vehicle. The ride was operated by Mobility21 Director, Raj Rajkumar. Although CMU is serving as the hub for the AI Task Force, it will eventually include other leading universities from across the country and the privacy sector and close engagement with the Army Research Lab and the Department of Defense’s Artificial Intelligence Center.